Choosing a wallpaper for our kitchen was no simple task. In fact, there were so many design elements to take into consideration that I had a hard time narrowing down my decision. 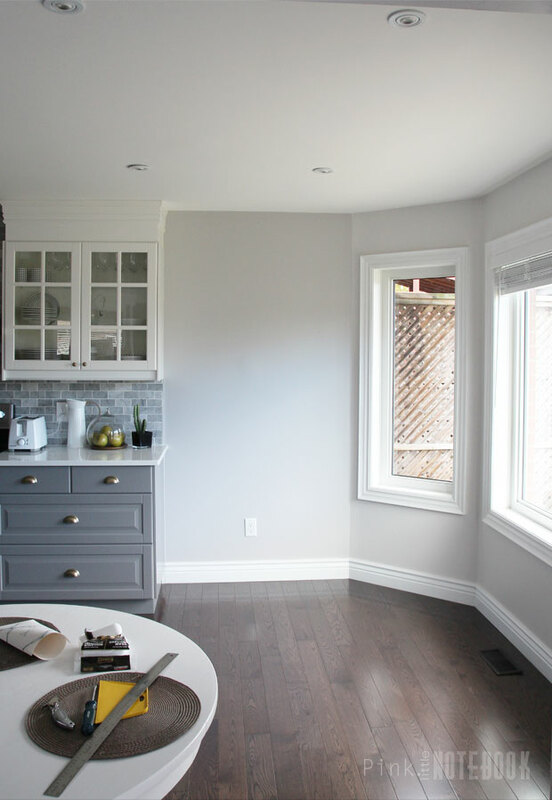 For starters, I knew I wanted a subtle colour palette that would flow seamlessly with our monochromatic kitchen—something with grey and white tones. Next, I was thinking, “visual interest”. I needed a pattern that could add texture and depth to the walls without being overpowering. 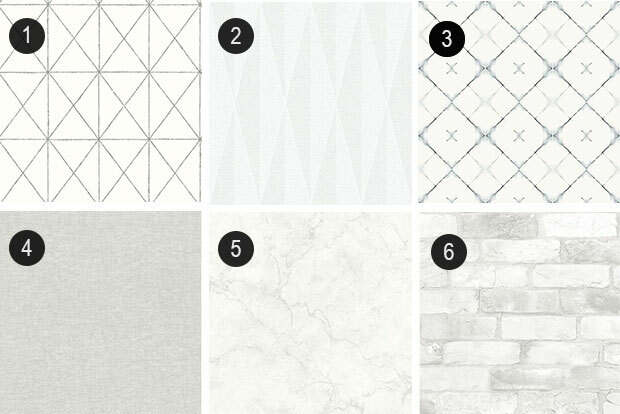 I found six options that all paired nicely with our kitchen scheme. I must have changed my mind about a dozen of times but eventually I settled on one. 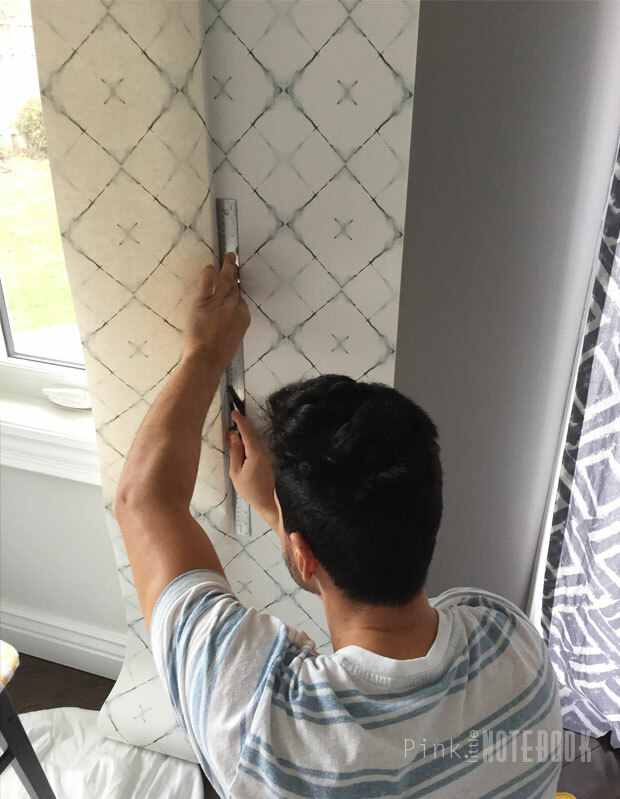 I picked Dagfinn Grey Modern Trellis Wallpaper from Brewster Home Fashions. 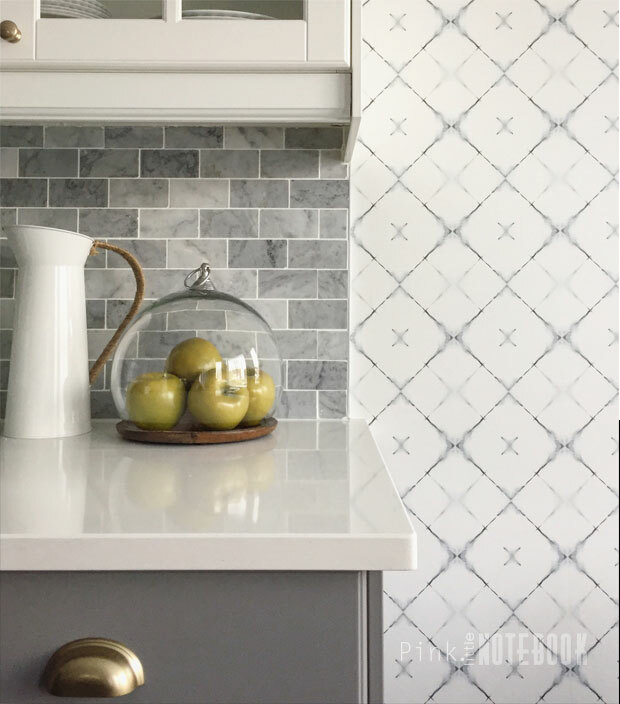 Although this pattern was one of the bolder choices, I felt the trellis pattern is just what I needed to add that traditional element with a modern twist. It flows great with the kitchen and adds that much needed connection I was so desperately looking for. When it comes to wallpaper, we’ve done accent walls and even ceilings, however, we’ve never tempted a nook quite like this before. There was a slight learning curve we had to overcome and it did take us a little longer than expected but we eventually got the hang of it. As you can imagine, there was lots of trimming. I thank my lucky stars that this particular wallpaper was unpasted, meaning you have to apply a paste to the wall in order for it to stick, which allowed for a mess free job. If we had used a prepasted wallpaper (where you use water to activate the glue on the back side of the paper), dealing with all these windows and small angles, this project would have made a total mess. So in short, if you are tempting a similar project, opt for an unpasted wallpaper. The key to straight lines is an extremely sharp cutting knife. Make sure you have a enough blades on hand because with all this trimming, they do dull out pretty fast. Since we had more window then wall, going over the windows were tricky. 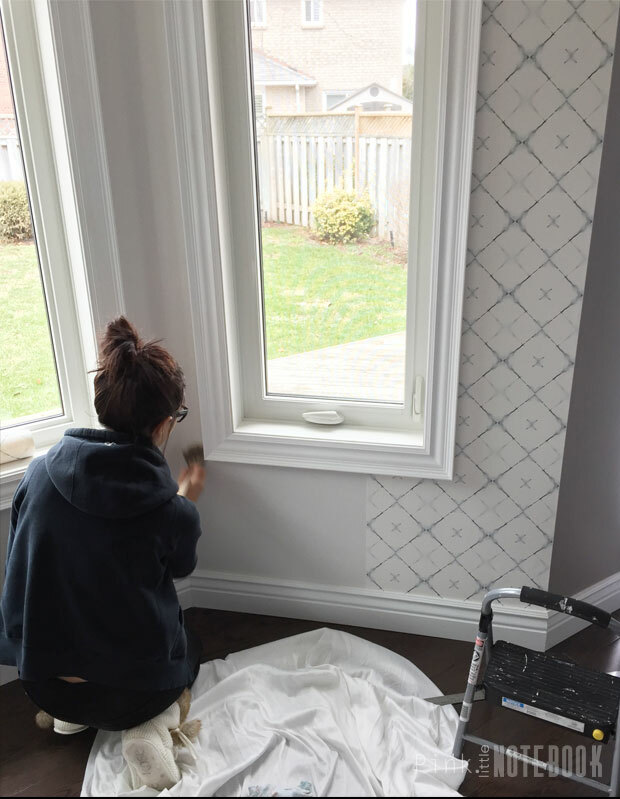 To make things more manageable with the small angles between the window frames, I cut the wallpaper that covered the window, leaving about an inch or two of excess wallpaper around the window frame. This made it easier to go back and smooth out the paper in the tight angels and allowed us to trim perfectly straight lines around the frames. I can’t wait to show you the plans for the built-in bench. 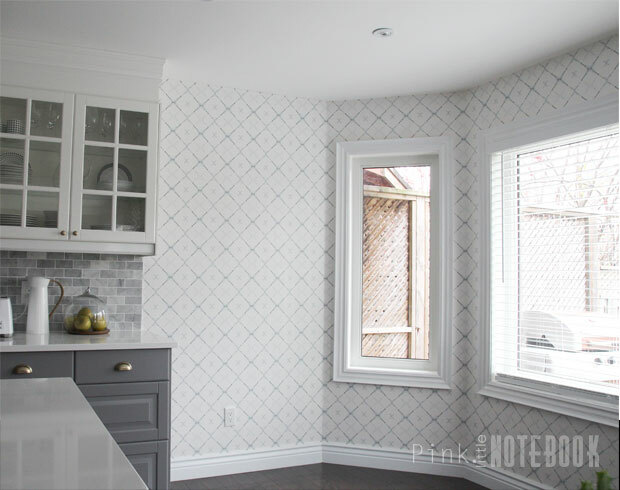 *Click through these links to see more about our kitchen plans, kitchen sink, creating an IKEA island, how to disguise a kitchen soffit, a kitchen recap, DIY built-in bench, DIY upholstered bench seat, about our kitchen chairs and our kitchen reveal. Disclosure: I’m thrilled to have collaborated with Brewster Home Fashions in this kitchen project. All views and opinions expressed in this post are my own. 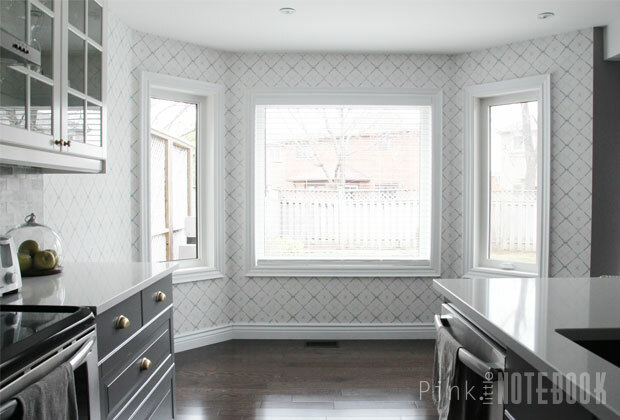 You kitchen looks great, the wallpaper adds a nice pop! I think it’s beautiful, it feels modern and fresh, great choice. Can’t wait to see it with the bench! Hi Sabrina,I love your kitchen so much and the wallpaper goes very nicely with everything. I love the wallpaper you chose!! It looks absolutely amazing!! Great! It looks amazing and so classy! I love it! Oh Sabrina, you guys did an amazing job and you chose the perfect wallpaper! 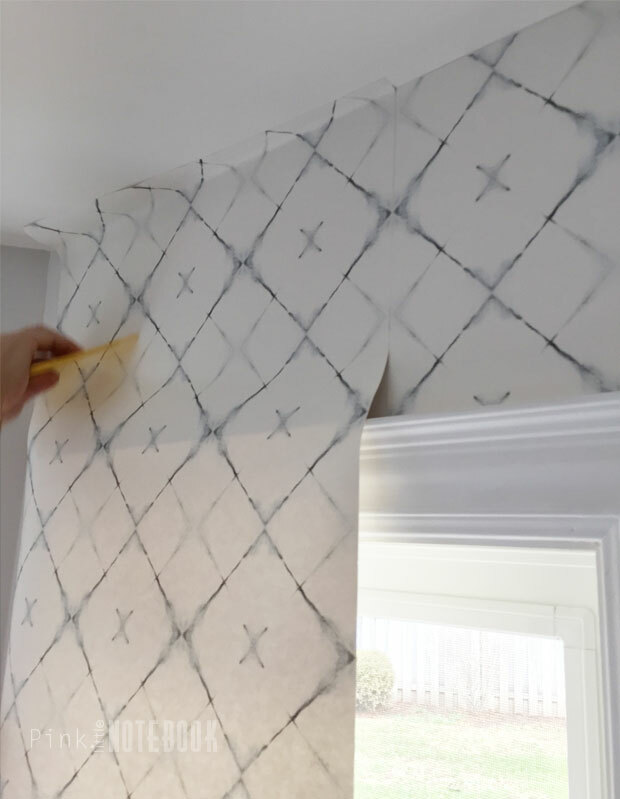 I have to say that this post was so helpful as I’m about to attempt wallpaper for the first time and I’m slightly terrified! Thankfully, it’s a small space 🙂 Love your entire kitchen! Beautiful work…as someone who has wallpapered for years, I hate to see people discouraged from using pre-pasted wallpapers because excluding them really limits ones choices. I do not find them messy at all.